Our product range includes a wide range of digital auto colorimeter. 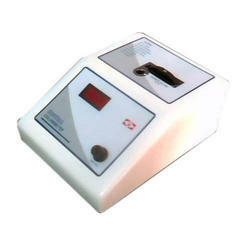 We are engaged in supplying of a wide range of Chlorine Colorimeter Digital. Manufactured by renowned vendors, these are extensively used to measure chlorine level. Moreover, we also ensure that the offered products are facilitated with features like reliable performance and accurate functionality. These are capable of detecting a range of 0 to 1.99ppm free, 2.0 to 6.00 ppm and pH of 5.9 to 8.2. Looking for Chlorine Colorimeter Digital ?